Welcome to the Butterfly Reflections, Ink blog! Thank you so much for popping in to visit. I hope the weather finds you well where you are and that you are safe from the fires in the western United States, dry from Harvey, Irma, and the flooding in Asia. Whew, I need some crafty therapy! 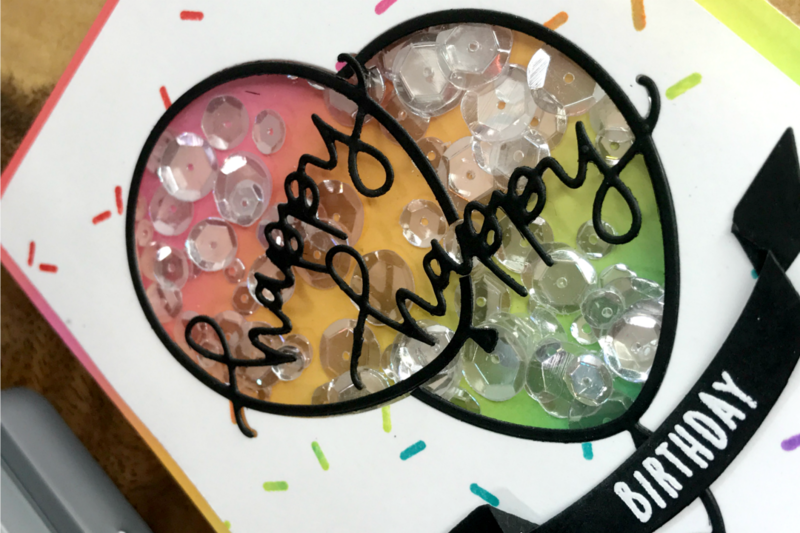 Janette here to share with you what I've created with Concord & 9th Happy Balloons and Sprinkles. With school back in session we are heavy on the birthday party circuit. 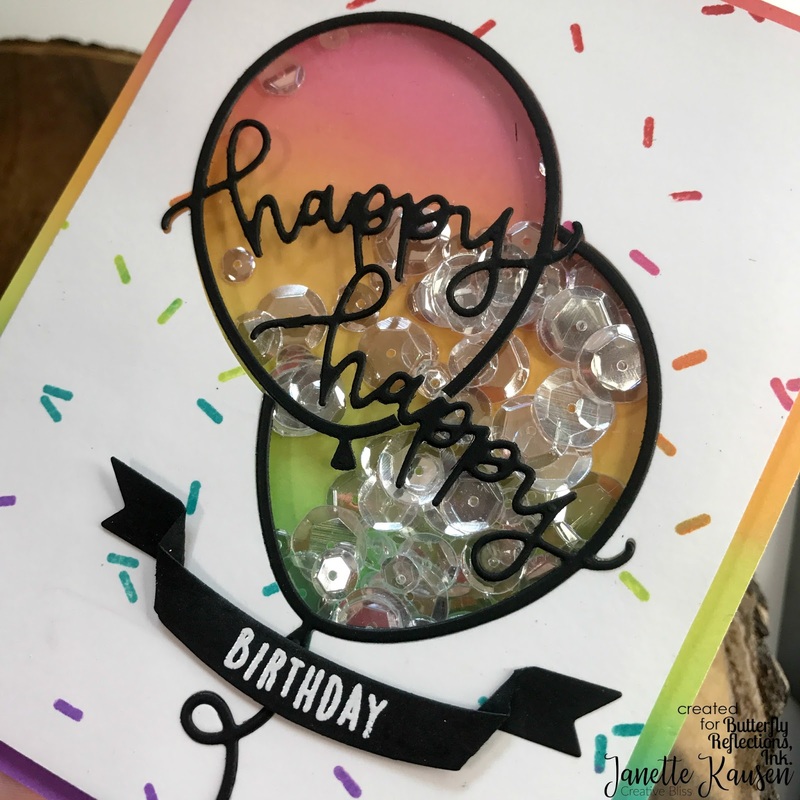 This card was relatively quick to whip up and who doesn't love rainbows and shakers?! Blend Distress Oxide inks on 5" x 6" Bristol Smooth paper with a mini ink blending tool and a foam pad. Use one pad for each color. I used Candied Apple, Picked Raspberry, Spiced Marmalade, Twisted Citron, Peacock Feathers and Wilted Violet. Distress Oxides blend like a dream on Bristol Paper! 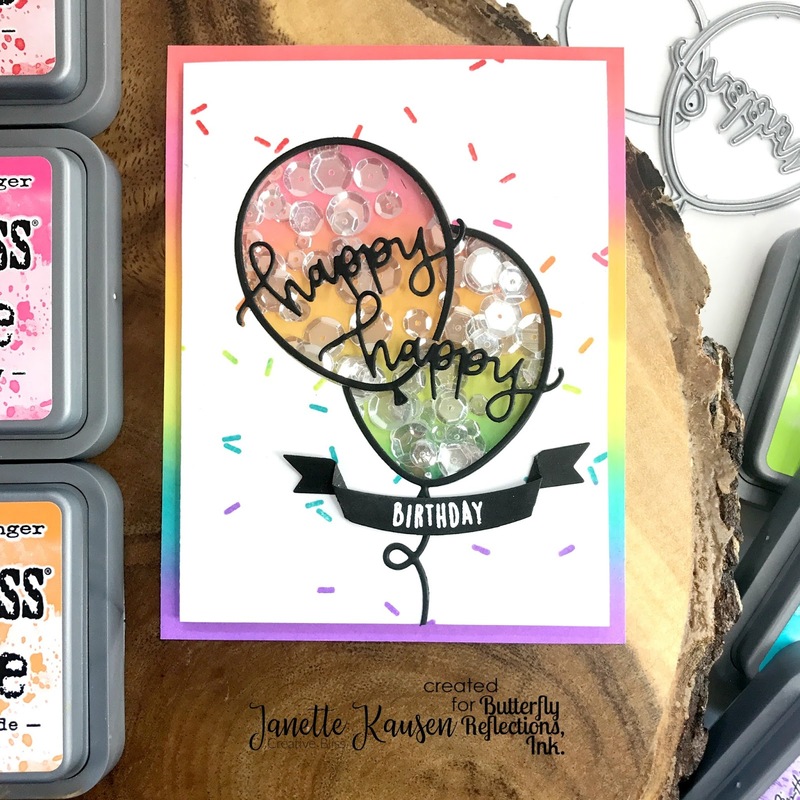 Stamp Sprinkles Turnabout with a Misti Precision stamp tool just inking up one rainbow color at a time. Use a Lawn Fawn Stamp Shammy to wipe away ink from areas of the stamp that you don't want it. Using the Misti allows stamping perfectly in the same place multiple times making the perfect rainbow a piece of cake! Die cut Happy Balloons into sprinkle panel 2x offset from one another. Die cut ribbon tail from bottom of balloon to bottom of panel. Die cut Happy Balloons and ribbon tail into black cardstock backed with 2 sided adhesive. Die cut a black banner. White heat emboss with Birthday sentiment. Apply acetate to back of sprinkle panel covering die cut opening completely. Adhere black balloon and ribbon die cuts to front of sprinkle panel on top of acetate. They will nest. Trim to make one balloon look like it is behind the other. Trim rainbow blended panel to 4.25" x 5.5". Apply 2 layers of foam tape around balloon openings on back of sprinkle panel. Be sure to leave no gaps in the walls where sequins can escape. Remove paper tape lining. Make a small mound of sequins on the rainbow blended panel in the area that will be behind the balloons. Adhere sprinkle panel to rainbow blended panel. Apply to A2 folded card base, slide in envelope and watch someone smile when they open it. I hope you have enjoyed this tutorial and that you have been inspired to get creating! Stay safe out there paper lovers! I loved those shaker balloons with smooth ink blending ! Great shaker ! Always super cool for birthdays.